plying Port Harcourt, Rivers State to Bayelsa have been lamenting over their predicaments of low patronage. The drivers who barred their minds in an interview with The Tide Correspondent at the Isaac Boro Park fly-over in Port Harcourt yesterday opined that the non-payment of workers’ salaries for months and activities of a taskforce headed by one Mr. Ayalla had been allegedly responsible for their predicaments. They hinted that government of Bayelsa is seeking to generate revenue at all cost to meet up its demands including payment of workers’ salaries and has therefore set up the taskforce to arrest mostly commercial drivers on wrong parking and made to pay the sum of N50,000 in order to generate revenue to the government. 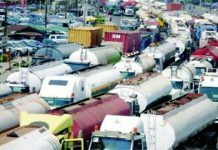 The drivers also disclosed that fee for sticker, MOT, Internal Revenue and Environmental is now N8,000, while some drivers that used to travel to Bayelsa State twice a day, now travels once a week. A driver, Diplomatic Ishiazu lamented that work is not going well as before as some had not travel for a week while the National Union of Road Transport Workers (NURTW), Isaac Boro Park flyover loads about eight vehicles a day. In his comment, Michael Jimmy also confirmed that the non-payment of workers’ salaries in Bayelsa State is affecting their transport business drastically in recent times and also complained of armed robbery attack along Ndele and Rumuji axis of Rivers State, calling for constant Police patrol especially in the early hours of the day. Another driver, Adeniyi Iko reiterated that “as there is no payment for workers in Bayelsa State, it is affecting everybody including we the commercial transporters, because as parents we cannot pay our children’s school fees, pay house rents and even feed”. Iko said before they used to load more than 30 vehicles a day but now they struggle to load four, adding “there is hunger on everybody. No passenger, no movement”. Also lamenting, Divine Oduoki said the no salary payment affects transport of business as the bad economy had made people not to travel, saying that he use to make two trips before but it is even difficult to make one trip in a week, and the bad market is also affecting the union at the Park.